Coleman has a new LED lantern that has 4 removable sections that can be taken out of the base lantern and carried as portable lights for things like late night trips to the campground bathroom. After getting back from the bathroom, it is just a matter of putting the portable section back into the base lantern. It eliminates the need for multiple flashlights, which my family is forever misplacing. 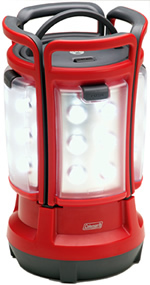 The lantern is powered by 8 D-cell batteries that are housed in the lantern base and will operate up to 75 hours on one set of batteries. The lantern has 24 LEDs total. Each of the 4 removable panels has 6 LEDs in it. Each of the portable panels contain a rechargeable NiMH battery to power it while it is off the base and will run up to 1.5 hours while away from the base. The MSRP is $69.99. Unfortunately, you won't be able to put one under the Christmas tree this year because they won't be available until January 2009. To see the lantern in use, watch the video below.